Shawnee Mission East 35, Lawrence 7 – Sunflower League leading rusher J.D. Woods put Lawrence up 7-0 early, but Shawnee Mission East scored 35 unanswered the rest of the way. Wyatt Edmisten led the Lancers with 150 yards on the ground and two touchdowns. Jackson Gossick added 124 yards and a score. Shawnee Mission East did not complete a pass on the night. Woods finished with 167 yards rushing on 27 carries. Shawnee Mission West 26, Olathe South 20 – Backup quarterback Jonathan Shull scored on a short touchdown run with 13 seconds remaining to lift Shawnee Mission West to a 26-20 win over Olathe South. The Vikings built a 20-7 lead, but Olathe South rallied to tie the game. The Falcons could have taken the lead, but their extra point attempt was blocked. SM West’s Isaiah Macklin returned the ensuing kickoff to the Olathe South 8-yard line, but the Falcon defense stopped the Vikings on 4th-and-goal from the 2. Olathe North 68, Shawnee Mission North 20 – Olathe North advanced to the quarterfinal round with a 68-20 rout of Shawnee Mission North. The Indians actually took a 7-0 lead before the Eagles scored the next 35 points. The game was 55-14 by halftime as Venus Triplett had three touchdown runs. Derby 39, Wichita East 7 – Derby led just 7-0 at halftime, but put Wichita East away in the second half. Darreon Jackson electrified the crowd with a ridiculous 85-yard punt return for a touchdown where he seemingly broke tackle attempts by all eleven Blue Aces. Hutchinson 64, Topeka High 46 – Defenses stayed at home in a combined 110-point effort from Hutchinson and Topeka High. The Salthawks converted three onside kicks to keep the pressure on the Trojans in the win. Blaik Middleton rushed for 260 yards and five touchdowns and Jacob Hardenberger added 185 yards and a score for Hutchinson. Turner Wintz also added 169 yards on the ground and three scores. Alec Beatty ended his career with a 315-yard passing effort in addition to rushing for two scores. Junction City 17, Wichita West 6 –Junction City led 14-6 at halftime and held off Wichita West with a second-half field goal to win. The Blue Jays advance on to host Lawrence Free State in the state quarterfinals. Lawrence Free State 27, Wichita Northwest 16 – Free state continually turned away Wichita Northwest scoring attempts and held on for a 27-16 win. The Grizzlies scored just twice on six drives deep into Free State territory. Northwest rushed for 293 yards on the night led by Jahlyl Rounds’ 117 yards and KeShaun McGaugh’s 82 yards and a touchdown. Free State was led by Bryce Torneden who rushed for a touchdown and passed for 118 yards and another score. Leavenworth 35, Topeka Seaman 6 – Leavenworth built a 21-0 lead at halftime and put Seaman away with 14 points in the fourth quarter. The Pioneers rushed for 357 yards on the night led by Sanchez Williams’ 273-yard, three-touchdown night. St. Thomas Aquinas 23, Bonner Springs 15 – Aquinas led 9-0 at halftime and by as many as 16 points twice in the second half before holding off Bonner Springs. Kyle Bollig led the Saints with 138 yards rushing on 31 carries. Karter Odermann added 115 yards on the ground on 19 attempts. Shawnee Heights 45, Lansing 7 – Tony Barksdale Jr. rushed for 220 yards and three touchdowns as the T-Birds rolled past Lansing, 45-7. Shawnee Heights rushed for more than 330 yards in the game. Pittsburg 42, Mill Valley 21 – Alex Barnes rushed for 300 yards and six touchdowns on 25 carries as Pittsburg doubled-up Mill Valley, 42-21. The Dragons broke open a back-and-forth game early in the fourth quarter after Jaguar starting quarterback Logan Koch went out with an injury. The next play, Pittsburg defensive lineman Sage Mahnken intercepted a screen pass at midfield and returned it to the Jaguar 14-yard line to set up Barnes’ fifth score and give the Purple Dragons a 35-21 lead. Bishop Carroll 67, Goddard 0 – Bishop Carroll got three Denzel Goolsby touchdown runs and a touchdown catch in the Eagles 67-0 win over Goddard. The Carroll defense returned three interceptions for touchdowns and registered a safety on an errant Goddard punt snap. Wichita Heights 10, Salina Central 7 – D’Aunte Mchaul intercepted Salina Central quarterback Malcolm Gardner at the 10-yard line late in the fourth quarter to seal Wichita Heights’ 10-7 win over the Mustangs. Luis Rodriguez’s 25-yard field goal in the second quarter proved to be the difference for the Falcons. Rodney Murphy led the Falcons with 102 yards on the ground, while Dalton Peters rushed for 106 yards for Salina Central. Salina South 19, Kapaun Mt. Carmel 14 – Sam Corona and Dalton Wassenberg rushed for touchdowns in the first half to give the Cougars a 13-7 lead that they would never relinquish. Salina South held Kapaun on fourth down twice in the third quarter, but South could not convert it into points. The game was defined by turnovers and missed opportunities. Othello Lewis intercepted a Kapaun pass and returned it to the 3-yard line where Corona punched it in to give South a 19-7 lead late in the fourth quarter. Kapaun would score, but could not convert the onside kick. Maize South 36, Liberal 0 – Maize South came away with a 36-0 shutout after a long trip to Liberal. Quarterback Korie Frausto played a part in three touchdowns for the Mavericks in the win. The Maize South defense shut down the Redskin offense and picked up a safety in the third quarter. KC Piper 33, Spring Hill 0 – Colton Beebe rushed for three early touchdowns to give the Pirates a 20-0 lead en route to a 33-0 shutout of Spring Hill. Jake Jones caught a 55-yard touchdown pass in the second quarter to give Piper a 26-0 halftime lead. Sterling Owens added the final Piper score in the fourth quarter. Paola 27, Ottawa 21 – Ryan Gleghorn scored from 1-yard out early in the fourth quarter to life Paola to a 27-21 win over Ottawa. The Panthers and Cyclones traded touchdowns throughout the game before Gleghorn’s deciding score. It was second 6-point win over Ottawa this season and the Panthers’ seventh game decided by single digits. Bishop Miege 62, Basehor-Linwood 0 – Top-ranked Bishop Miege cruised to a 63-0 win over Basehor-Linwood by scoring 49 points in the first half. Quarterback Ryan Willis completed 14 of 19 pass attempts for 246 yards and touchdowns to three different receivers. Fort Scott 24, Baldwin 12 – Mason Knopp passed for 195 yards and two touchdowns to lead Fort Scott to a 24-12 win over Baldwin. Alex Fink caught seven passes for 152 yards and a score for the Tigers. Andover Central 38, Augusta 33 – Jordan Birch rushed for 186 yards and three touchdowns on 36 carries to lift Andover Central to a narrow 38-33 win at Augusta. The Jaguars led 14-0 after one quarter and 24-13 at halftime. Dustyn McEachern hit Connor Hurst on a touchdown pass to pull the Orioles within 31-27, but Birch tacked on his third score to expand the Jags’ lead to 38-27. Buhler 49, Ulysses 37 – Buhler scored 21 points in the second quarter to take a two-touchdown lead, and expanded that lead to 28 points after halftime. Dillon Engelland rushed for 203 yards and three touchdowns to lead the Crusaders. Jace Williams added 198 yards and two more scores. Ian Rudzik led Ulysses with 228 yards rushing. Topeka Hayden 40, Coffeyville 16 – Jacob Head completed 13 of 15 pass attempts for 240 yards and three touchdowns to lead the Wildcats past Coffeyville, 40-16. LaDarrius Johnson led Coffeyville with 215 yards rushing on 21 carries. Mulvane 28, McPherson 25 – R.J. Rieger tossed a 5-yard touchdown pass to Jace Price with 29 seconds remaining to lift Mulvane to a 28-25 upset over McPherson. The Wildcats led 21-11 in this game before McPherson took a 25-21 lead. McPherson played a second consecutive game without starting quarterback Kyler Kinnamon. Holton 54, Osawatomie 8 – Indie Allen rushed for three touchdowns totaling 125 yards as Holton eliminated Osawatomie, 54-8. The Wildcats will advance to the 4A-II quarterfinals where they’ll travel to Columbus next Friday. Columbus 35, Girard 12 – Columbus sustained two long scoring drives in the third quarter to break open a 13-6 game. Jace McDown rushed for more than 120 yards to lead the Titans. Columbus defeated Girard 41-16 earlier in the season. Santa Fe Trail 24, Jefferson West 12 – Santa Fe Trail notched the school’s first playoff win since 1996 by defeating Jefferson West 24-12. The Chargers score a single touchdown in each quarter; three of those coming on Darric Cashier touchdown runs. Cashier finished with 103 yards on the ground. Frontenac 48, Burlington 13 – Frontenac routed Burlington 48-13 to advance to the state quarterfinals. The Raiders scored five touchdowns in the first quarter and rushed for more than 330 yards on the night. Andale 49, Smoky Valley 18 – Smoky Valley played well, but Andale was too much in a 49-18 win. The Indians led 35-12 at halftime and got a touchdown run from Hunter Knoblauch and a scoring strike from Luke Walstad to Hank Eck in the second half. Concordia 28, Pratt 20 – After trailing 20-14 in the second half, Concordia rallied for two touchdowns to top Pratt 28-20. Ethan Bechard threw a touchdown pass and rushed for the Panthers’ fourth quarter touchdowns. Drake Hake piled up more than 220 yards on the ground in the game for Concordia. Clearwater 14, Wamego 7 – Clearwater pulled off the 14-7 upset win at Wamego. Despite a 3-6 record coming in, the Indians were able to top the 8-1 Red Raiders. Clearwater led 14-0 after three quarters. Holcomb 35, Colby 6 – Holcomb scored all 35 points in the first half of a big win over Colby. Trey Teeter completed 20 of 29 passes for 310 yards and three touchdowns to pace Holcomb. Blake Richmeier added 84 yards on the ground and two scores. Troy 50, Valley Heights 6 – Troy defeated Valley Heights 42-25 earlier this season, but this meeting was all Trojans. Tristan Speer rushed for two early touchdowns and played a part in five Trojan scores. Cuttar Huss caught a pair of touchdown passes from Speer. Lyndon 61, Marion 40 – Dawson Swinehart rushed for five touchdowns and passed for two more as Lyndon outscored Marion 61-40. Swinehart rushed for 259 yards and passed for 165 yards on 8 of 11 attempts. Adam Janzen rushed for 237 yards and four touchdowns for Marion in the loss. Onaga 26, Doniphan West 13 – Onaga beat Doniphan West for a second time this season.. The Buffaloes defeated Doniphan West 16-8 to open the season. The game was tied at 13 at halftime before the Buffaloes took over. Michael Bliss led Onaga with 133 rushing yards and two touchdowns on 25 carries. Olpe 56, Mission Valley 14 – Brady Scheidegger returned the game’s opening kickoff 85 yards for a touchdown and Olpe rolled from there on out. Eagle quarterback Bo Krueger passed for 110 yards and long touchdown to Scheidegger. Krueger also rushed for four scores. Scheidegger returned a punt for a touchdown to go along with his kickoff return. Ell-Saline 28, Sedgwick 20 – After losing 44-12 to Sedgwick early in the season, Ell-Saline turned it around to get a 28-20 playoff victory over the Cardinals on Friday night. Ell-Saline led 14-7 at halftime, but two Jordan Scarlett field goals pulled Sedgwick to within 14-13 mid-way through the fourth quarter. Ell-Saline put it away shortly after with a Dakota Came touchdown run and a two-point conversion to make it 22-13. Came scores again later to make it 28-13. Brylie Ware scored with under a minute to go to bring Sedgwick within 28-20. La Crosse 34, Meade 0 – Sheldon Schmidt rushed for three touchdowns as La Crosse rolled to a 34-0 shutout of Meade. 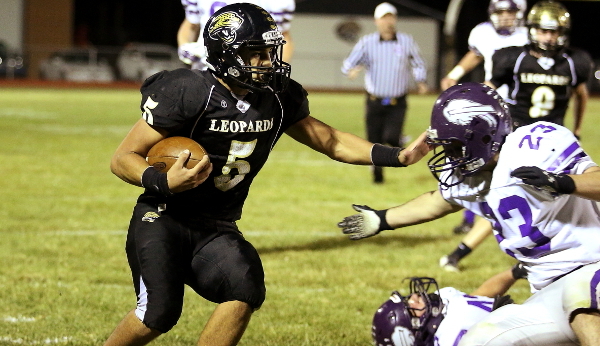 Jack Garcia compiled more than 235 yards of total offense for the Leopards. Phillipsburg 22, Sacred Heart 15 2OT – The Panthers and Knights went into overtime tied at 7. Sacred Heart scored first on a Cedric Salas 7-yard run to give the Knights the 15-7 lead after the two-point converstion. On Phillipsburg’s possession, Sam Sage hit Nate Prewitt on an 11-yard touchdown pass and Sage added the two-point conversion to send the game into a second overtime tied at 15. The Panthers got the ball first and scored on a Stuart Lenneman 10-yard run for a 22-15 lead. Sage then sealed the game by intercepting a Sacred Heart pass on the Knights’ possession. Oakley 28, Elkhart 14 – Oakley broke a 14-14 tie with two fourth quarter touchdowns to win at Elkhart, 28-14. Elkhart led 14-7 after one quarter after a Tanner Burnett touchdown run and a Tyler Sklenar touchdown pass to Izzy Barco.